Native to the Indian area, this solitary palm has a stout trunk and arching bipinnate leaves, the fruit is red to 2 cm diameter. Once the palm reaches maturity, it flowers over a few years before dying. 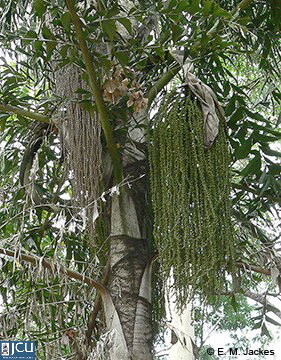 Fruiting branches are produced from the top downwards once the palm reaches maturity. Should not be planted close to buildings as in strong winds it is likely to be blown over. This palm is not wind resistant.